How Many Different Types of Materials Does It Take a Damp Proofing Company to Get a Job Done? No, there is no jokey punch line here! Well, the short answer, is probably, as many as it takes because this is certainly not a “one type fits all” business. At Preservation Treatments, we are fortunate in that we have both access to and experience of working with many different types of materials and always attempt to ensure the chosen, or specified product is the right one for each unique job. The following may help provide an insight to some of the products we will be using for damp proofing and waterproofing work, along with an understanding why, in some areas, we will mix and match systems. 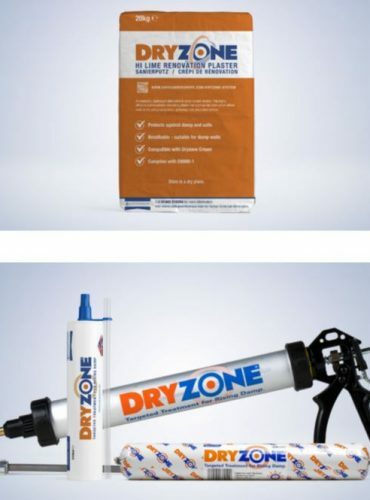 Firstly, when it comes to the installation of a chemical damp proof course, we will, as a rule, be specifying Safeguard Dryzone injection cream; for the simple reason that we believe it to be the best available option. When it comes to rendering after the installation of a damp proof course, there are a number of options available to us, including sand and cement render, which will incorporate a salt retarding additive and will be mixed to our specification for either 2-coat, or 3-coat render. Alternatively, it may be better to apply a lime based plaster instead of a dense render; in which case, we would probably use Safeguard Hi-Lime Renovating plaster. This is more often the chosen option on listed buildings, or buildings which require an improved thermal rating (compared to dense render). 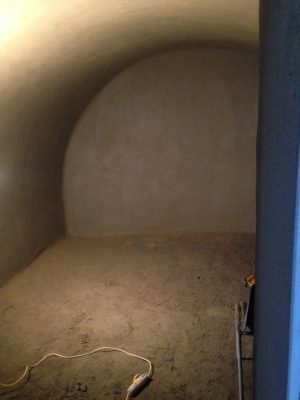 The Hi-Lime Renovating plaster is more vapour permeable than a render coating. Moving on to waterproofing systems, this is where there are so many different options, in terms of product specification. Essentially, we would be considering either a “Type A” system (barrier protection) or a “Type C” system (drained protection) as stated in BS8102:2009. In this blog, we will consider internal waterproof systems. Sika waterproof render system, including other Sika products such as Sika combi-flex, Sika-dur etc. and also, whether or not we will use Sika pre-bagged materials, or site mixed materials incorporating Sika No. 1 waterproofer. Mapei based waterproof render system including Mapei products such as Mapei Lamposilex, Mapei Adesilex and Mapei Mapeband. Natcem 35 quick-setting waterproof render, which is particularly useful in areas where water ingress is evident, or likely, due to its rapid hardening qualities. Various types of waterproof slurry, including products such as; Vandex BB75, Mapei Mapelastic, Koster NB1Grey. A Type C system refers to a drained system, where water ingress is a managed process within the building. Essentially, systems known as “cavity drain membrane” systems are installed, which allow water ingress to occur but then remove it by way of drain channels, which take the water to a sump / pump station so that it is pumped out of the building to a suitable drain. In the main, Preservation Treatments will use products from either Delta, or Wykamol, although, on occasions where we need to specify alternative systems, such as those from Safeguard / Oldroyd and Newton, then we will. There are occasions, which are becoming more-so, where there is a need to specify a mixture of a Type A system along with a Type C system in order to comply with current legislative requirements. 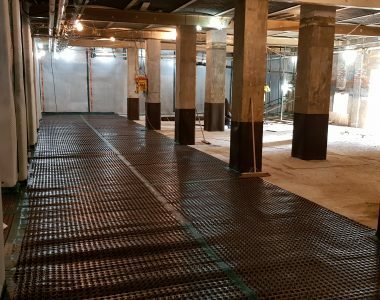 For instance, where a project requires two systems of protection, then it may be necessary to apply a waterproof slurry to both walls and floor surfaces, followed by the application a cavity membrane system. As you see, there really is not a situation where one size, or one type fits all. If you would like to discuss the requirements relating to a specific project with one of our Surveyors, or would like to arrange for a site survey, please get in touch with us.